I'm cheating at fudge this year. Yup. Normally I bring cookies everywhere we go, and I planned on making them again even though I no longer get to eat 39 pounds of cookie dough. Way to go guts, way to not enjoy all the delicious things made with gluten. 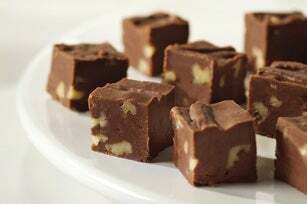 But Big Guy requested fudge. Anyhoo... I used to make fudge on the stovetop with fluff and whatnot, but not this year! That's it! Toss it all in a microwaveable bowl, set the power at 50% and then you're almost done! Stir the mix after one minute increments for 5 minutes total. I added walnuts when it was done. Then pour it into an 8x8 pan lined with parchment paper lightly greased. Toss in fridge or freezer to set. Bam. Fudge. In less than 10 minutes with very little cleanup involved. Easy enough that I could have lil guy in his jumper in the kitchen doorway, have everything made and cleaned up before he lost interest. Awesome.